In this blog post series we will explore, how to automate Amazon Web Services (AWS) by using Vagrant. The series is divided into three parts. Readers that are interested in the automation part only can skip part 1 (the AWS EC2 console part) and jump directly to part 2, since both, part 1 and part 2 are self-contained. In Part 1, we will introduce Amazon Web Services (AWS) and will show how to sign into a free trial of Amazon, create, start, shut down and terminate a virtual machine on the AWS EC2 console. Part 2 will lead you through the process how to use Vagrant to perform the same tasks you have performed in part 1, but now we will use local Vagrantfiles in order to automate the process. Part 3 is the shortest part and will show, how Vagrant helps you to go beyond simple creation, startup, shutdown and termination of a virtual machine. 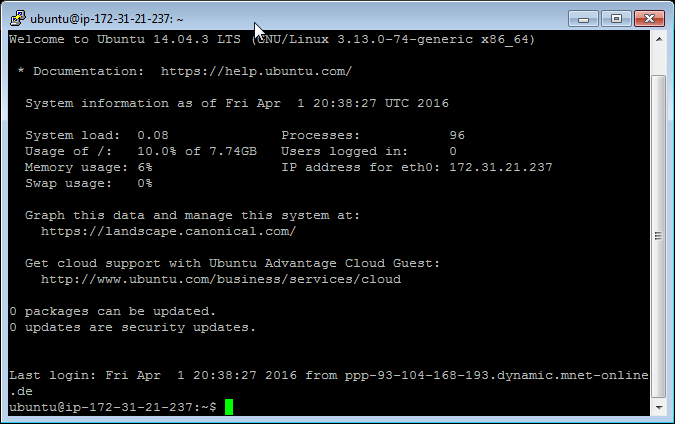 In less than 10 minutes, you will be able to install a Docker host on AWS. With a few additional clicks on the AWS EC2 console, you are ready to start your first Docker container in the AWS cloud. 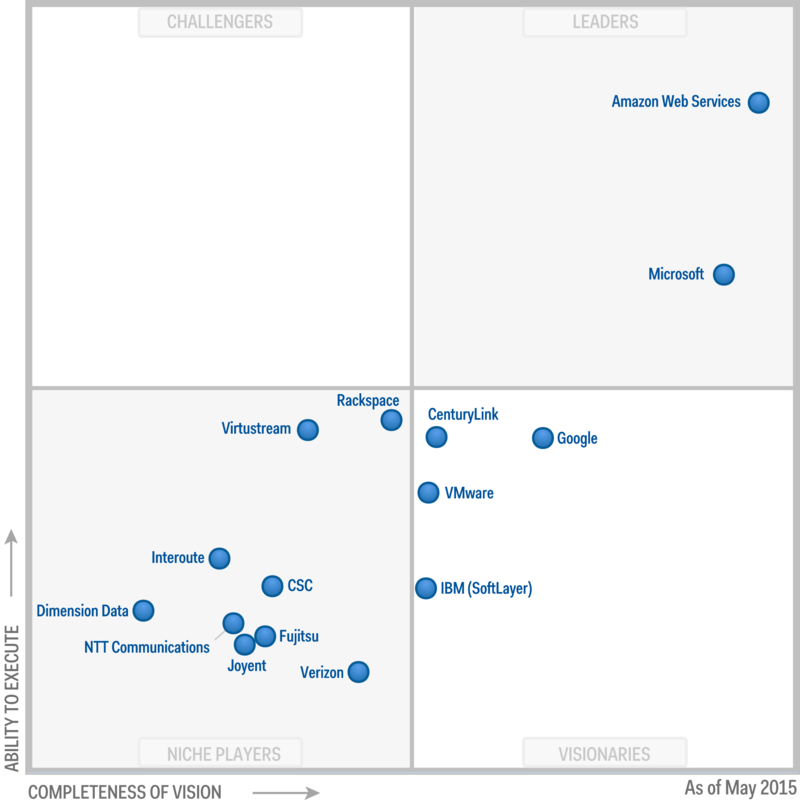 According to Gartner, Amazon Web Services (AWS) is the No. one service provider in the public cloud IaaS space. Amazon is offering a “free tier” test account for up to 12 months and up to 750 hrs of a t2.micro Linux instance as well as 750 hrs of a t2.micro Windows 2012 instance. For more details, check the free tier limits page. For services outside the free tier limits, check the AWS simple monthly (cost) calculator. 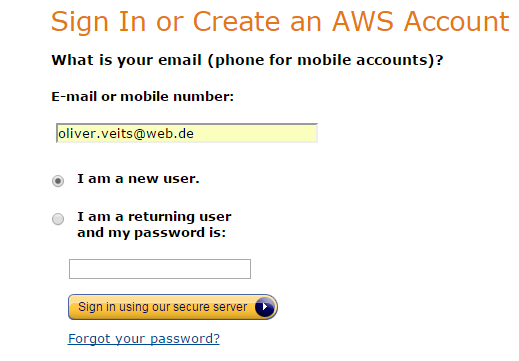 Per default, AWS is assigning a dynamic private and a dynamic public IP address. The public IP address and DNS name will change every time you restart the instance. Deleting an instance is done by “Terminating” it. For a long time, the terminated instance will still be visible in the instance dashboard as “Terminated”. The sense and non-sense of this is discussed in this forum post. Many thanks to Brian Cantoni, who has shared with us a (much shorter) Quick Start Guide on the same topic. Part 2 of my detailed step by step guide is based on his work. This image is ‘Free tier eligible’ so I expect not to be charged for it. Note that there are two image types offered for each operating system: HVM and PV. HVM seems to have a better performance. See here a description of the differences. Note, that only t1.micro is ‘Free tier eligible’. Larger images will not come for free, as we might have expected. 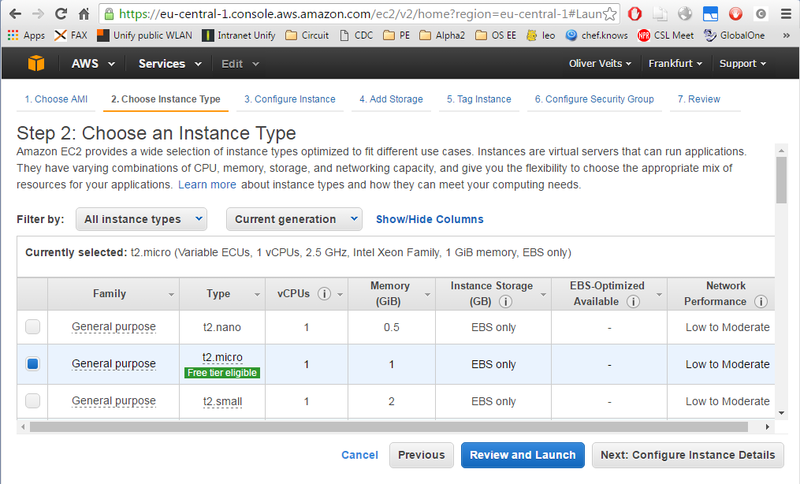 However, note that also the smaller t2.nano instance is not ‘Free tier eligible’. If you want to use a t2.nano image, you will have to pay for it from day one. If you plan making use of services that are not ‘Free tier eligible’, the AWS simple monthly (cost) calculator helps you to estimate your monthly cost. Now click on Review and Launch. Note the IP address and the Public DNS will change every time the image is started. 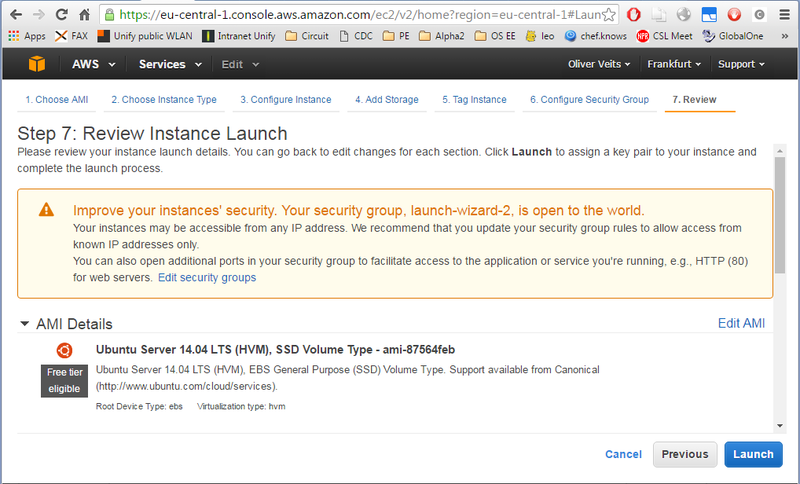 For static IP addresses, a so-called Elastic IP needs to be rented from AWS. If this IP is assigned to a free tier instance, also the rented Elastic IP seems to be free of charge. If you are connecting your instance from a Linux or Unix operating system, follow Step 4 a) and use the built-in SSH client. For Windows systems, we recommend to follow step 4 b) based on putty. Note: With Cygwin on Windows, you might also try using step 4 a). However, other Linux emulations on Windows like the bash shell that comes with Git do not play well with editors like vim, so I recommend following 4 b) in this case. Since I am using a Windows machine and the formatting of a ssh session in a CMD console using command line ssh in a bash does not work well (try using vim in a Windows CMD console), I prefer to use putty on Windows. Convert the pem file to a ppk format putty understands. For that, import the pem file using Putty Key Generator (puttygen) via Conversions->Import Key->choose pem file -> Save private key with ppk extension. 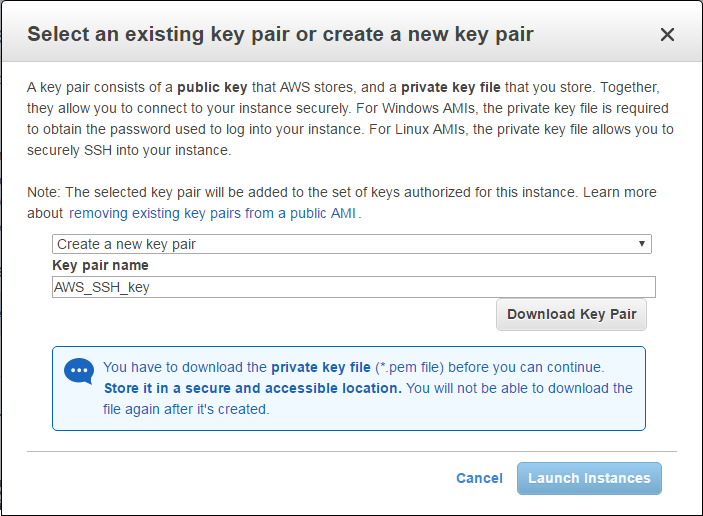 Now you can add the path to the ppk file to Connection->SSH->Auth->Private key file for authentication: in the putty client. Only the private IP addresses and DNS names are kept, while the public IP and DNS are freed up. Next time you start the system, the public IP address and public DNS name will be different and you will need to update the DNS in your SSH client for external access. 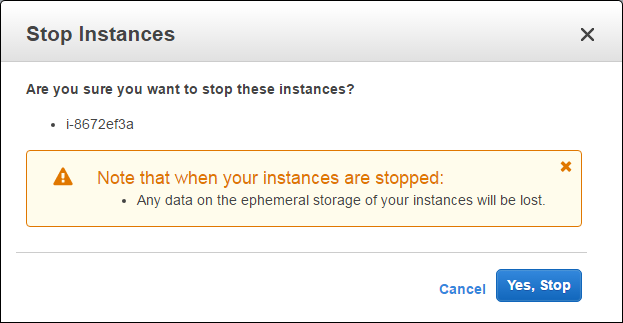 Alternatively, you also can terminate the instance, which will delete the instance from AWS database. Note, however, that you still we see the instance in a “Terminated” status. The sense and non-sense of this is discussed in this forum post. 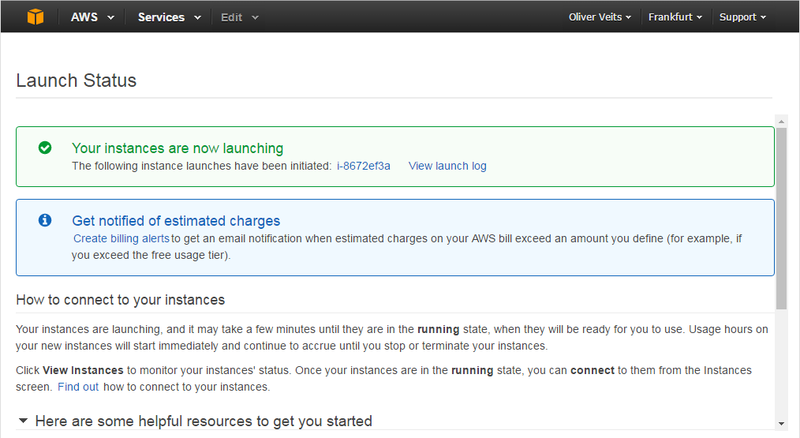 An estimation of the expected cost can be calculated with the AWS monthly cost calculator tool. 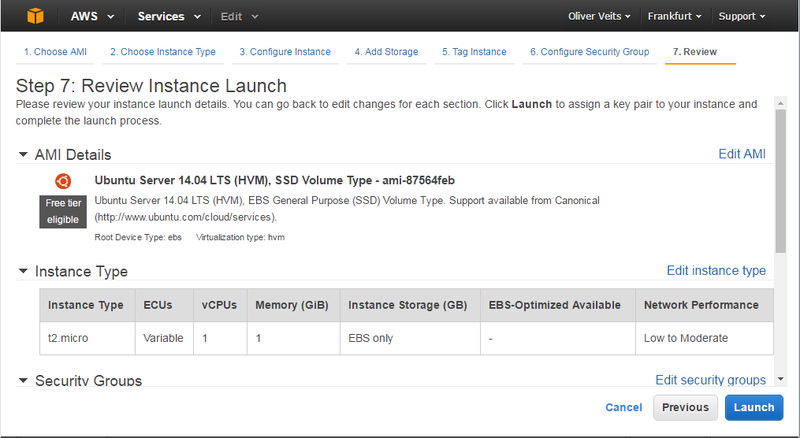 The actual cost can be observed on AWS’ billing page. At the bottom of the page, there is a “Set your first billing alarm” link that allows to define an email alarm as soon as a certain threshold is exceeded. Note for users that are not in the East of the US: I was a little bit confused that the “Set your first billing alarm” link (https://console.aws.amazon.com/cloudwatch/home?region=us-east-1&#s=Alarms&alarmAction=ListBillingAlarms) contains a variable region=us-east-1, while I am using resources in eu-central-1 only. 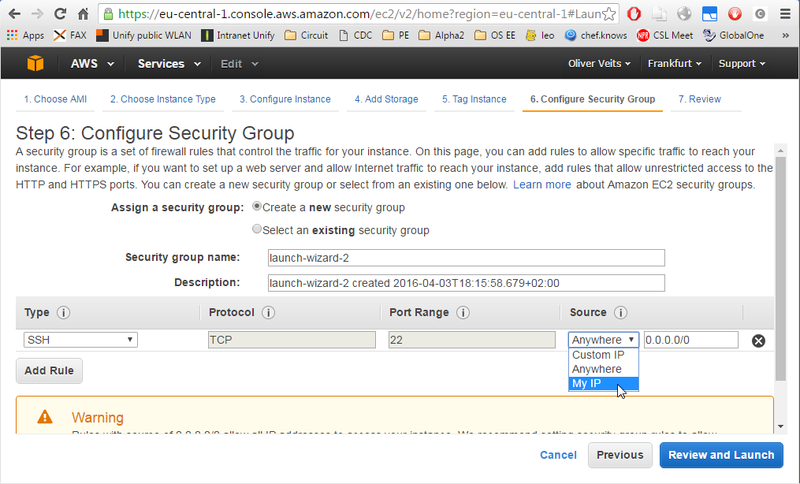 However, the corresponding link https://eu-central-1.console.aws.amazon.com/cloudwatch/home?region=eu-central-1#alarm:alarmFilter=ANY does not allow to set any billing alarms. I assume that the billing for all regions is performed centrally in US East for all regions (I hope).